Our SHM project discussed under the Civil Engineering Industry Solutions page elsewhere on this website, used two NI CompactRio (cRIO) systems and a server computer running NI LabVIEW software. 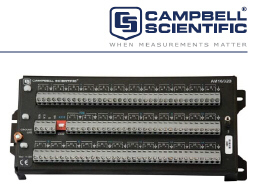 A Campbell Scientific AVW200, Vibrating Wire Spectrum Analyzer and an AM16-32, VW Multiplexersensors were installed on the bridge to connect to several VW sensors. The VW sensors were to be monitored by the cRIO systems, however there was no commercially available interface for connecting the sensors to the NI cRIO computer. PAC engineers developed a driver program for the cRIO that communicates via the cRIO serial port with the AVW200, which in turn, controls the AM16-32 multiplexer to which the VW sensors are attached. The program is able to acquire data from each sensor at a rate of 3 sec/sample and send the data to the server running LabVIEW. Please contact us if you are interested in purchasing this driver software.